After several weeks of rain and stormy weather we finally had a nice day today, a perfect day for sandbox plaster casts. 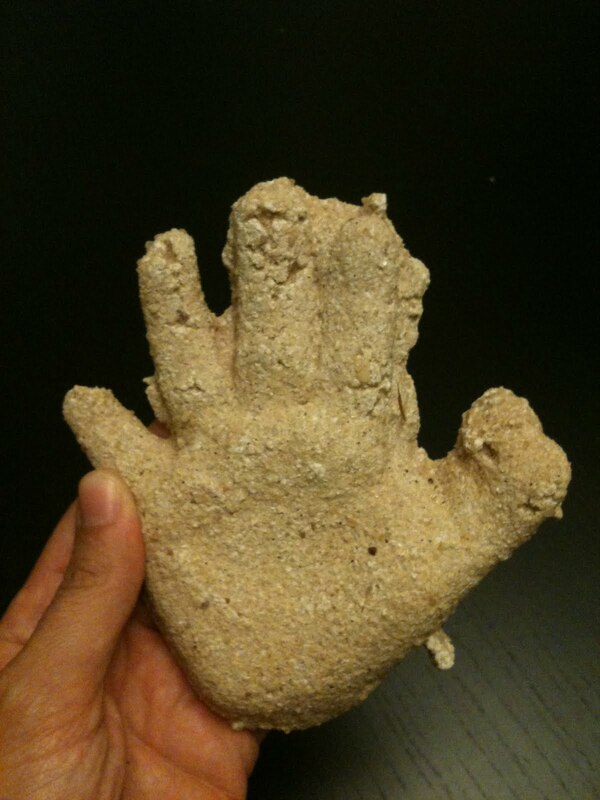 I have done various forms of plaster casting before and used sand as a base to cast. Which made me think that the sandbox would be a perfect place for plaster casting, especially with kids. 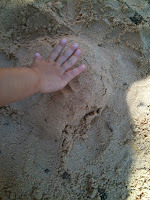 We began by building up a few little mounds in the sandbox and then pressing objects into the mounds. The Bee did her hands and feet but I had a lot of trouble getting a good imprint of the Bean's hand so we just did her feet. 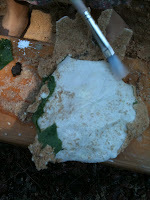 We also found a few larger leaves in our yard and pressed them into one of the mounds. We then mixed up the plaster. 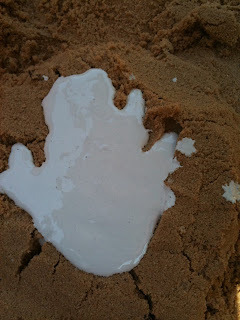 We used plaster of paris wich you can get at any craft or home imporvment store and mixed it two parts water to one part plaster. I always end up having to mix in more plaster but basically you want the mix to be the consistency of a thick pancake batter. 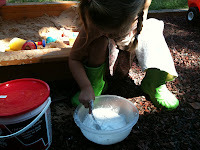 Once fully mixed we poured the plaster directly into the molds the girls had with their hands and feet. 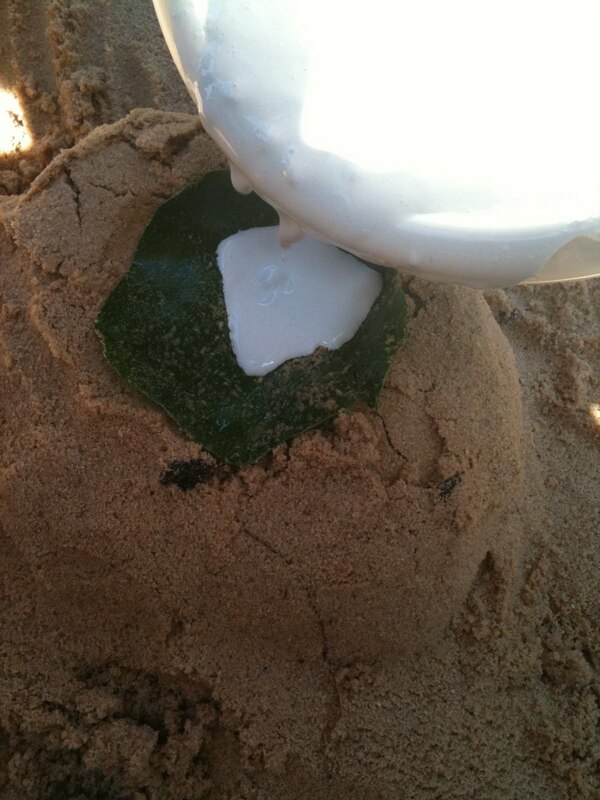 For the leaves, after we pressed them into the sand, we gave them a quick spray with a non-stick kitchen spray before pouring the plaster directly over the leaf. The plaster takes about an hour to set up so we went in for lunch. After lunch we went out and pulled the plaster casts out of the sandbox. 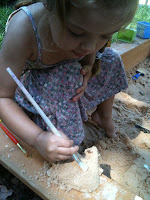 We then used paint brushes to brush the sand off of the plaster, like archeologists. 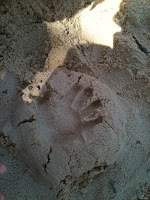 The Bee loved brushing the sand off! The finished casts are so neat, the girls enjoyed seeing the textures from the leaves appear in the plaster cast and were amazed to see their own hands. We may have to revisit this project in a few weeks to make plaster hands for holiday ornaments. This is so cool! Would love to try this one day with my boys. Holiday ornament project??? I want in! so cute! I am a sucker for little handprints! Thanks for linking to the Sunday Showcase & hope to see you again next week. Thanks Bern! I am a sucker for little hand prints too. The Sunday Showcase is one of my favorite places for great ideas. I will definitely visit again!